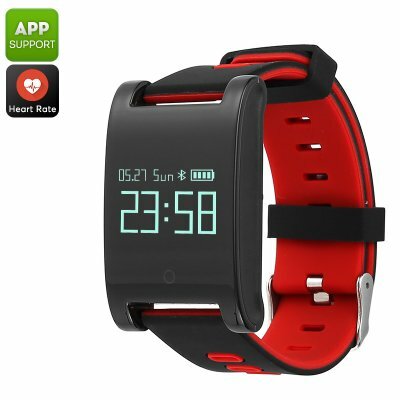 Successfully Added Domino DM68 Bluetooth Smart Bracelet - Blood Pressure, Heart Rate, Pedometer, Distance Tracker, Calorie, Sleep Monitor (Red) to your Shopping Cart. Keep track of your health and increase your activity levels with the Domino DM68 Bluetooth smart bracelet fitness tracker. This fitness tracker bracelet comes packed with an abundance of health and fitness features. It can be paired with your iOS and Android phone via Bluetooth 4.0. Along with the dedicated mobile application, it allows you to keep accurate track of your daily activity levels. Additionally, it informs you about incoming phone calls and messages. The Bluetooth watch itself comes with a 120mAh battery. Thanks to this, you’ll be able to enjoy all its features throughout the day without needing to recharge. This Bluetooth smart bracelet fitness tracker comes with a highly accurate pedometer that keeps track of the steps you take throughout the day. It additionally features a distance tracker and calorie counter. With these features at your side, you can be guaranteed that you’ll always meet your daily activity levels that are needed to meet your future fitness goals. Thanks to its sedentary reminder, you can be guaranteed that you’ll never miss out on your upcoming exercise sessions again. Your fitness tracker bracelet furthermore features an integrated heart rate monitor. This feature lets you check your heart rate before, during, and after workout sessions. With this information at hand, you’ll be able to adjust the intensity of your upcoming workouts to optimize your results. The Bluetooth watch also treats you to a blood pressure test as well as a sleep monitor that makes sure you’ll get the proper amount of rest needed in between your workouts. The Domino DM68 Bluetooth Smart Bracelet Fitness Tracker comes with a 12 months warranty, brought to you by the leader in electronic devices as well as wholesale electronic gadgets..